This article first appeared on the Fire of Nocturne. 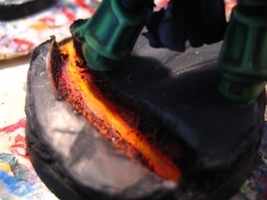 A tutorial on making Lava Bases for our favorite snot green marines! 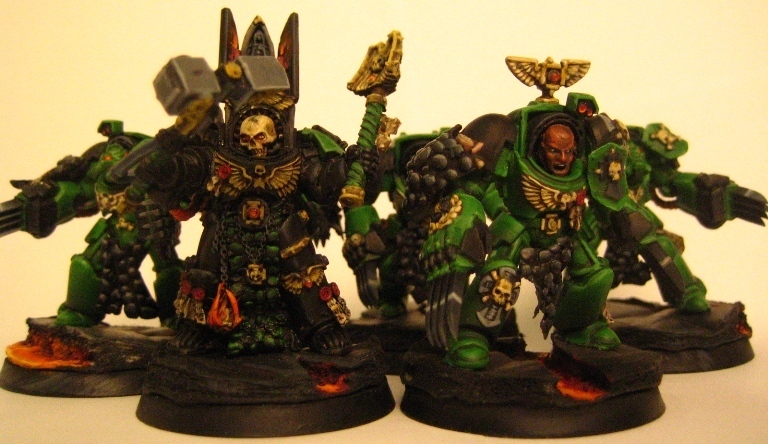 Okay, this is how I do the lava bases I use for my Salamander army. Foamcore board (Mine has a white card surface with a foamy but formidable inside and black paper backing. 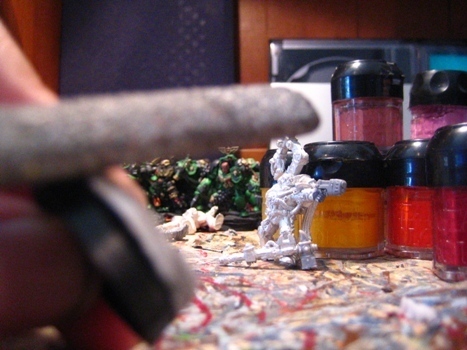 Trace out the base on your foamcore board with a pen. Cut out the circle you have made. 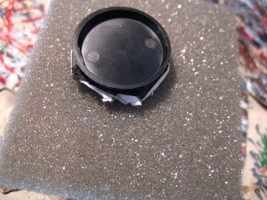 Do not worry that it is not perfectly circular or smooth, as it is probably better if the foamcore hangs out a little bit over the base. 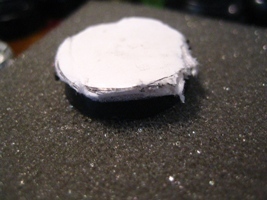 Glue the foamcore to the base. 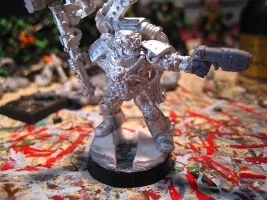 Most likely the foamcore sticks out over the base a bit. 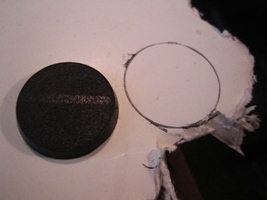 Cut off the irregular points that over hang the base, and then file the sides of the foamcore into a smooth circle about the same size as the base. Using the razor blade, cut out a path for some lava to flow through your base. Cut about as deep as the foamcore is, but you don't need to necessarily cut the paper backing at the bottom (the paper is glued to the Citadel base). 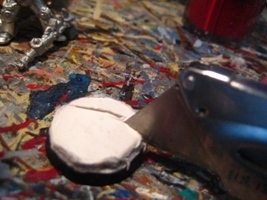 Make two cuts (the banks of the lava stream) and dig or slice out the foamcore that is in between the banks with your razor blade. 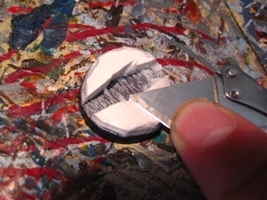 You can skip this step if you want a flat rock base, but I then use the flat side of the razor blade to make impressions into the foamcore to make an uneven and jagged surface. Attach your mini. If you cut a stream of lava through the middle of the base, it sometimes looks good to place the mini with either leg on either side of the lava. You can even leave some bases with little to no lava, just to provide variety in your army. 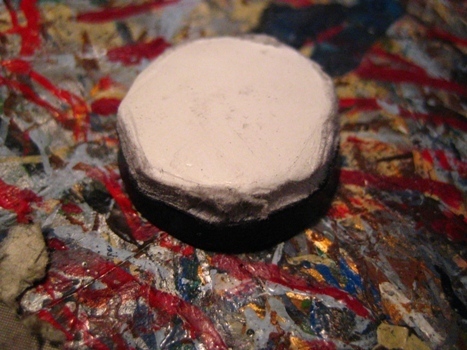 I undercoat the base with Chaos Black. Then add increasing amounts of Codex Grey to highlight the rock, until you just have Codex Grey (or near to it) highlighting the very edges. For the lava, start with Red Gore and mix in increasing amounts of Blazing Orange. As you highlight, make thinner and thinner lines, move towards a thin line in the center. At pure Blazing Orange, add Sunburst Yellow up until pure Sunburst Yellow when you should have a very thin Yellow line in the middle of the lava.